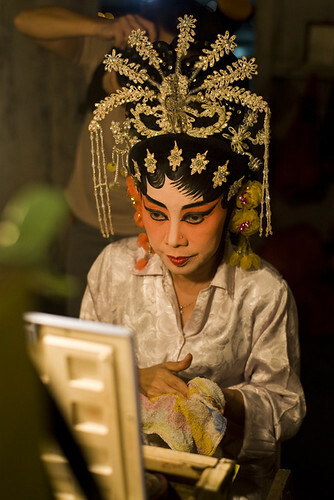 There is a strain of thought that regards the island's surviving professional wayang troupes as antiquated creatures living on borrowed time, staid relics of history who cling to the past with no hope of a future. In contrast, assemblies of amateurs are feted for their dedication to new scripts, embrace of fresh approaches and displays of technical prowess. Having neither the linguistic mettle nor the aesthetic wit to judge the tapestry of this musical dialectic, ducks can offer no disagreement with established claims that societies of part-time performers enjoy higher standards, superior access to funds and a constant renewal of creative energies fuelled by private dedication to the craft and personal investments in operatic livery. In this worldview, the few who still eke a living from the art of their forefathers offer a sorry sight. Their costumes are as old and daggy as the practitioners, who know in their hearts a mighty handful of tales but little more than the songs of their youth and the lore of their apprenticeship. These troupes, which once held sway over tropical nights and commanded the strength of pan-Malayan unions, now pay the price of professional privilege, lacking the wiles and will to woo worldly councils with sweet words and elevated visions in the language of administrative persuasion. Tradition also stands on flimsy scenes, offering mere sketches and loose outlines that rely on improvisatory whim rather than the rigour of formal rehearsal. The street holds no candle to the stage, for one can well afford to advance the art with injections of foreign talent, while the other merely bears the burden of a choice to give it all to a vocation well past its peak. For who in his right mind would choose a life on the edge of sustenance over the leisure of subsidised acclaim? This dichotomy of artistic merit, which appears to favour permanent arenas over the planks of wayside theatres, sheds scant light on the way reenactments of worn yarns serve less the sensibilities of mortal men than the demands of immaterial lords. 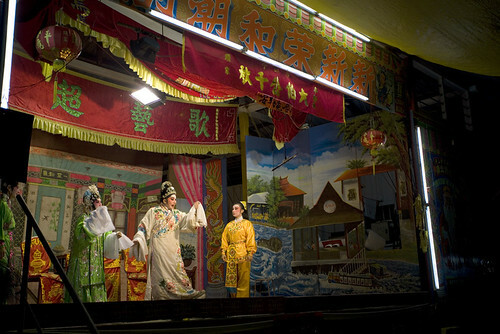 Dilettantes probably have no time for the thankless chores of the taoist calendar or the paltry budgets of temples and minor clans with little to offer but space for a ramshackle stage and the devotion of a night or two to the amusement of implacable deities. Photographers are also drawn to these acts of ritual like bugs to an incomprehensible bulb, but they, too, have no answer to why the troupes stick to their guns amid a barrage of disparagement from the powers-that-be and those who play only to the gallery. Is it kinship, a reluctance to breach rules of spiritual protocol or simply a gesture of kindness to obsolete souls that feeds the remaining strains of Teochew heard from the grounds of shrines at pains to honour their ancestors? Personal edification has no place in these tired liturgies, which aim to please none but the need to know that the past persists in the present. Some patrons now attempt to balance heaven and earth by giving a portion of festivities to evergreen crowd pleasers. But to a few of the faithful, such displays, which no doubt fatten the coffers of secular bodies, heighten the dilemma of those who'd question the wisdom of a leap of fate from what is rite to what amounts to a roaring revelry of song. 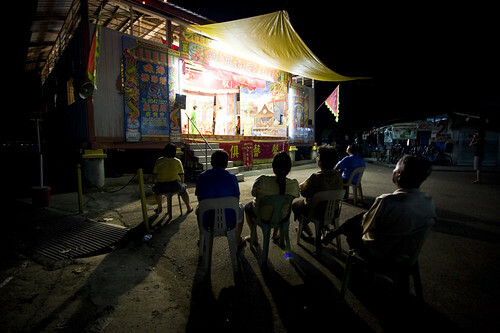 The grand old man of southern seafarers marked his birthday this month with a week that brought rare festivity to the last, sleepy village of Pulau Ubin. Flags in faded green and dull red greeted visitors who arrived at the island's jetty and received the helping hands of temple workers or volunteers who proudly donned polo shirts in fresh orange. The celebrations had begun last Monday, when the villagers and their kin from the mainland marched up a hill by a quarry just beyond the settlement to invite the kindly gentleman and his beastly companions to spend a week in 'town'. A day of ritual then concluded with the sounds of ancient scripts and scraps of voices high and shrill on a stage of creaking wood. Unlike other incarnations of the ancient mariner, who fete their origin on the second day of the second lunar month, the lord of this local rock prefers to be honoured on the holy day of Buddha, a soul whose greatness, it is said, he hoped to emulate. The next morning, Vesākha, was a day of double joy, as prayers and offerings continue anew to Tua Pek Kong in his seaside abode and the Jade Emperor, who graced the occasion with a brief survey of the rites and rigour of a way of life that seeks harmony between humans and earth. A hog and fattened goat met their ends, becoming nourishment for devotees and a source of spiritual pleasure to gods still keen on flesh and blood. Trays of braised duck and burnt fowl awaited the faithful, who had journeyed across the straits on a fleet of bumboats that provided free passage in the dying hours of the day. Joss burnt in wholesale volumes, as sticks of fragrant smoke were purchased and stuck in jars of ash for a mere minute or two before busy helpers removed them to make way for more. 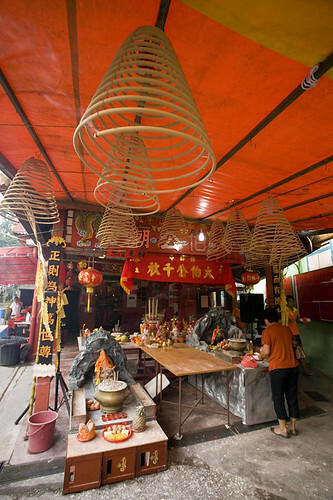 Those who sought greater favours raised their bids with thicker rods or coils of incense that temple workers hung over the altars using bamboo poles. An old man sat by a wall that separates the worshipers from a seafood restaurant, notating on pieces of red paper the names of those who wished to be remembered for their generosity and faith. A shrine to a native god lies behind the temple, the remnant of a prettier predecessor in the neighbourhood that vanished in flames. The good lord brandishes a stick and a wavy blade, accepts no offerings of pork and is content to dwell in a lodge with few barriers between his earthly seat and the spiritual realm. Back in the village square, mythical monsters pranced under the power of men who channel the strength of lions and giant lizards to bless the devotion of followers in search of fortune and a year of good business. The ruler of heaven was then sent packing at teatime and strains of Teochew accompanied an evening of hope, as the temple elders and lords of the netherworld oversaw the crossing of a bridge of peace and prosperity by souls in need of luck and a season of brighter prospects. The next three days ran a few notches lower, with the temple receiving a mere trickle of knees and a skeletal assembly before the stage at sundown. There were thus fewer spectacles to detract from a superficial study of the world within the walls of a raised, red-roofed platform where the agents of modernity seem a rude transgression into a time that sings a different tune. When we arrived, it was still bright and the troupe were gathered by tables on the set to match tiles and wit before retreating into a theatre of dreams in vivid colour. Mangy curs roamed the surrounding lanes, dipping between the houses to prance on wet sand or tailing the gates of children on stainless steel steeds. 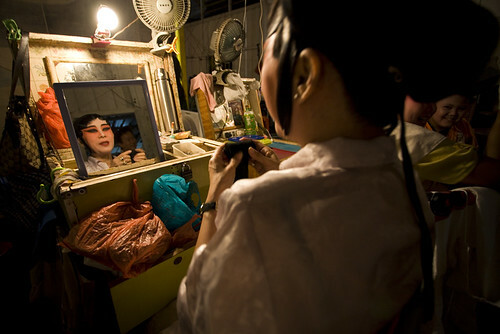 Behind the rear curtain, a long island of chests with drawers, smokes and tiny mirrors served as dressing rooms for the cast, who applied powder and paint to their skin as blue turned black and bright yellow bulbs cast a warm glow over actors whose age and affliation are masked by layers of foundation and rouge. Eyes are enhanced, noses sharpened, brows defined and lips reddened to turn mortal faces into living legends from stories that still come to life to the beat of cymbals and the wail of strings. The stage outside is set with furniture from feudal times, though a bicycle and bumboat intrude on the fringes of a medieval countryside. 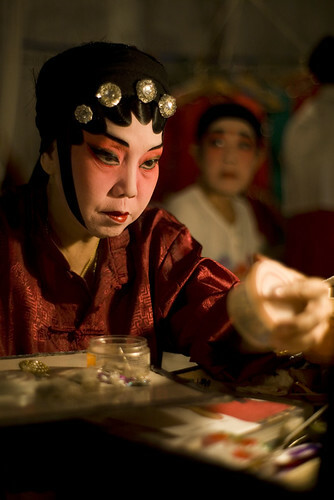 A young man, the grandson of the doyenne who founded this troupe, entertains the curiosity of divers as he toys with fancy headgear, his hair in a mesh that hides a tousled crop and protects the twin-finned cap of a Confucian scholar. Undershirts and long-armed gowns are worn with care, beards plastered on smooth chins and ornate assemblies of pearls, sequins and tassels are nudged onto heads and judged before a panel of glass and gazes that regard the creations before them with cold affection. On an altar by the doorway to the outhouse, a small shrine seats a trio of deities armed with pacifiers. Childlike in feature and articulate in repose, the godlings are pacified by offerings of rice crackers and cream confections. 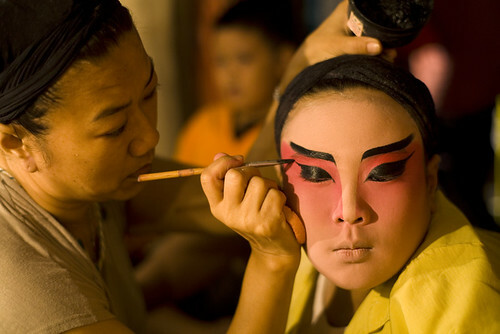 A few members of the troupe, who appear little older than the robed figurines, snacked on extruded corn as fine brushes traced lines of pigment on wrinkle-free cheeks. Their elders sang along to the ensemble in the wings as they continued their preparations and the first stirrings of an ancient scene rang through a village of latter day saints. 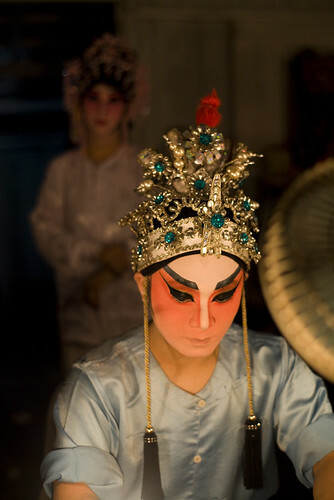 Ritual broke the fourth wall as a temple worker brought platters of fruit and sweetmeat to the stage, where an actress in red accepted the gift while her colleagues maintained the integrity of a excerpt that formed the first of three nocturnal dramas. The treachery of courtly justice, a tale of tears and second chances, and the slaying of a ghoul by a company of clowns offer scant entertainment to ears with little comprehension of a melodious dialect and no memory of the myths that engendered this art. Backstage once more for a final glimpse of vintage glamour, we crave for signs of acknowledgement, a wry smile, a twinkle in a glance, the hint of a frown. Little gets in the way of invisible cues and everything falls apart with each passing minute of airs and recitatives that find echoes from low stools and hinged chambers where mementoes of youth and yore are stored. The end is nigh and there is no way back across this bridge of sighs, a tour de force of head and heart in a sea of song that is fast fading and fewer ford. Translation of To Ostatnia Niedziela (“The Last Sunday”) by Jerzy Petersburski. Your smoky gaze, the silly songs and the sharp bite of your lips when the brandy burns through and you twist my mind in a rag of knotty bits. Heritage, both human and natural, suffers a double blow in this island where there is little time and thought for life beyond labour and laidback leisure. For why should one care for treasures whose existence and passing are neither acknowledged nor regretted? Perhaps it’s because there’s no way to put a price, much less a mark-up, on a memory. So fleeting sights and sounds that yield little in the pleasure of profit remain ghosts in mortal shells until the earth spirits them away to realms beyond the reach of living men. 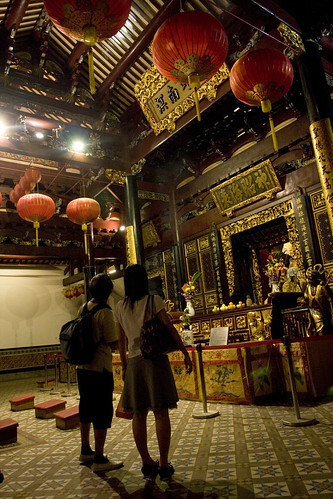 It’s no wonder that the vast majority of guests who sat, moved to rapt stillness, in the courtyard of the Thian Hock Keng Temple last Friday, were remnants from an earlier age. For who else cares about the past in the present save those who have lived through it and a few deviants who prefer their history alive and kicking than languishing in the luxury of gilded galleries? Few who walk by Telok Ayer Street and Lau Pa Sat would recall that these stately structures once gazed unobstructedly towards the southern sea to welcome and wave away those whose journeys led them to Singapore in search of good fortune or for good. And only the makers of the Hokkien Huay Kwan Building across the street could reveal exactly why the wind and the water decreed that their premises offer an open navel of nothingness on the ground level facing the temple gates. Nobody, however, seemed to have told the owners of PIL Building at Stanley Street that the gods prefer their view unblocked. 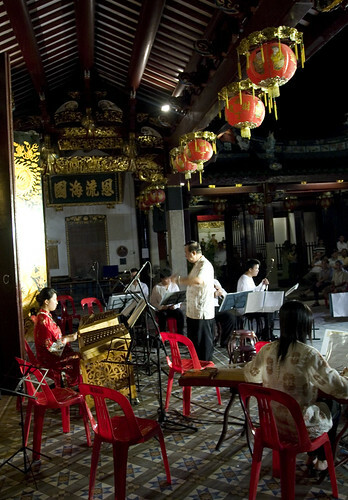 It was a rare din that rang from the temple grounds that evening, as the Siong Leng Musical Association offered a glimpse into the sonic world of Chinese palaces during the final centuries of Pax Romana. Probably little known even to those who reckon themselves Sinophiles, Nan Yin (literally Southern Sounds) is a form of music that traces its origins to the Han Dynasty (206BC-220CE). 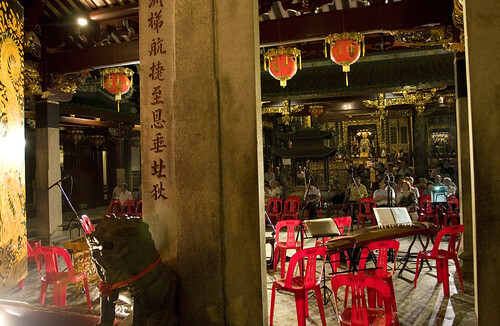 Court musicians who fled northern wars and purges settled in southern cities such as Quanzhou in Fujian, where they refined their art in what is said to be an unbroken lineage that survived the dynasties of Tang, Song, Yuan, Ming and Qing. 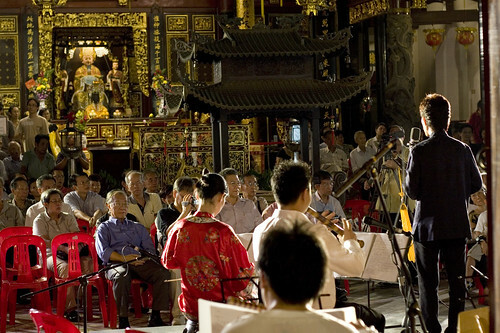 The orchestra that has become synonymous with Chinese music is a modern creation that uses a tiered, chordal-based orchestration and the tempered scale popularised by Johann Sebastian Bach. 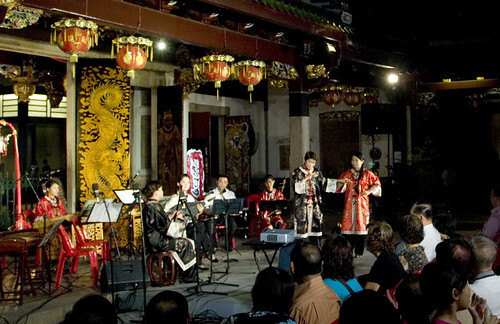 For all its ubiquity and semblance to tradition, it has little to do with the ancient music of the middle kingdom, save its “application of Chinese musical aesthetics… in embellishments and musical expression, particularly of the melodic lines.”1 Nan Yin offers fewer familiar favourites, in its use of a tonal system and musical notation wholly alien to players schooled in conservatoires. 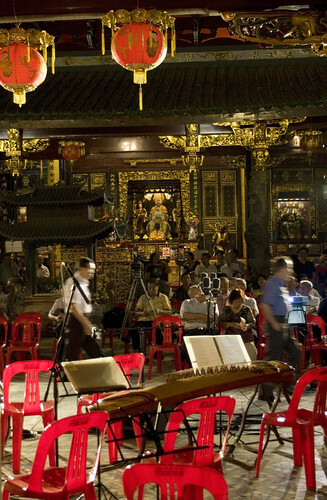 It’s easy to see (or hear) why few take to Nan Yin. The music is serene, slow and deliberate in its casting of shifting halftones and fine inflections that demand a ear attuned to close attention. There are no pleasing cadences or tuneful manipulations of melodrama. Instead of soothing chords, the harmonies float unresolved in the melodic interplay of singer and instrument. The pace is relentless in its measured rendering of every phrase and paucity of texture that results from an ensemble so small each voice cannot but maintain a transparent intensity that resonates with subtle depth even from afar. Belted out in an archaic form of the dialect, the songs retell the melancholic fates of mountains and maidens and the men that moved them. 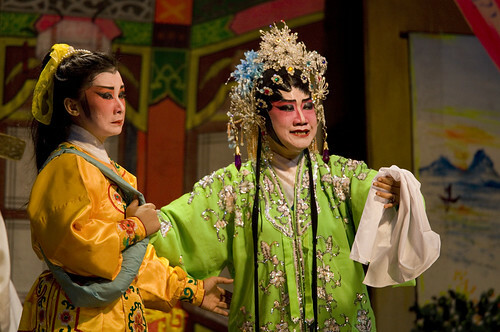 Guan Huai, performed by the Siong Leng Musical Association. 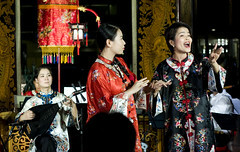 Lyrics by Teng Ma Seng, Music by Michael Toh. After a preamble, the audience was led to rise and turn to face the altar in a plea to Guan Yin for protection and peace. For the night’s repertoire honours the gentle bodhisattva who bestows mercy and manchildren to her faithful. A veteran master of ceremonies provides an earthy introduction to each number, and joins the troupe for one. The players take turns to deliver poetic solos, alternating with instrumental recitatives and a revolving chorus of aunties. In these darkened hours of long and languid shadows, it is not too hard to see a scene from a century past between the lacquered guards and ensemble robed in peony and gold, were it not for the polished lights and gleaming vending machine that offers a dose of reality by the doorway. No sins of the flash disturb the musicians. This was an event guided less by rituals of etiquette than by rites of passage that call for earnest enjoyment unhindered by rules of decorum or barriers of dressing. 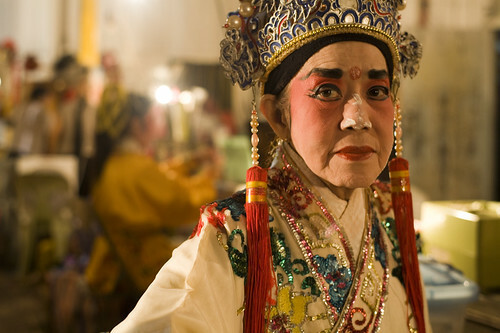 While two ladies trade barbs in a scene from a Li Yuan opera, prayers are offered, incense lit, children wander, old men dream and dodgy ducks manage to waddle unrebuked and unhumiliated by the high thresholds that straddle every door. Unperturbed by frequencies beneath its field of vision, a brown bat flitted through the halls to capture a nocturnal brigade of bugs drawn to the floodlights. 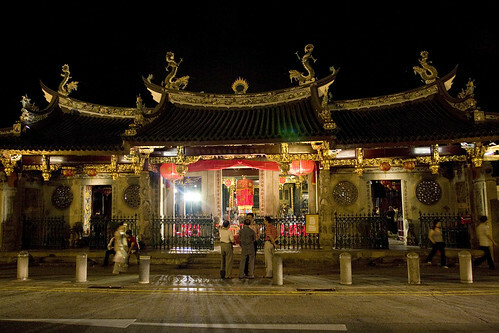 From the quiet street in a city of cold comforts, the temple glows with the warm red of lanterns and plastic chairs, inviting passers-by from all ages past and present to listen and linger to the music of souls who built a town now forsaken by both its makers and those who made their fortune in it. 1 Joseph E E Peters, Evolving Traditions in Music, in Presentations at the 2nd ASEAN Composers Forum on Traditional Music, 11-24 April 1993, ed. Joseph Peters, National Arts Council, 1994. Combining celestial menace with divine mischief, Uranus from Gustav Holst's The Planets has been likened to the Sorcerer's Apprentice on acid. The conductor here resembles a former Japanese prime minister, while the tambourine girl has a face that could give you an enema. There's also a cute French horn player with a handy napkin on her lap (the better to soak up all the stray bodily fluids). Best played at full volume after midnight on speakers with a wide dynamic range to bring the best out of the climatic organ glissando.